I’ve found that the challenges of going from one child to two are much more difficult than the challenges of going from none to one. When going from none to one, there are theoretically more adults in the household to help out than when going from one to two. That means that there’s someone else to give you a hand (and a break) when getting overwhelmed. When there are two children and two adults, that means that there’s this perfect one to one ratio that reduces the likelihood of either parent actually getting some downtime. Eudora and Norton are awesome (even when they aren’t) and I’m glad to have them. But when Eudora first came home, we had issues where she was crying and the husband and I would look at each other and ask “Well, when did we feed her last?” The answer was invariably a blank stare that silently stated “I have no earthly idea.” When we would “trade off” so that the other could sleep, then it was even worse. I know that there’s this wonderful device called Itzbeen. I always thought it was silly; who needs a device to help one keep track of when she does things like, oh, feed her children? Answer: I do. I also have an iPhone, so I figured that there had to be an app for that. I searched in iTunes for “Itzbeen” and was willing to pay whatever necessary. Anything to help me keep track of things so that I had just a little bit more of a clue about when I’d done some fairly basic things like changed my daughter’s diaper last. I found something that was a better price than I could have hoped for, and it did exactly what I wanted. The app is called “iBabyLog”, and it’s free. You can keep track of anything that you want to keep track of in there. Diaper change, nursing, bottle feeding, bathing, milestones, activities, doctor visits, vaccinations… and there’s more. It’s not just a button to let you know that you changed a diaper at x time. You can be specific in terms of what was in the diaper, did the diaper leak, what was the color/consistency of poo (and sadly, these are things that one pays attention to), and even what type of diaper. When you feed, you have options for things like how much, what you gave baby, and if baby burped or didn’t. Additionally, you can display a run down of the day in terms of the events you logged so that you can tally how much baby fed or if baby really is pooping more than usual today. It’s pretty easy and user friendly. There’s only two flaws with iBabyLog. One is that because it’s free, it’s ad driven. The other is that sometimes it “crashes” and you have to reopen the app and tap back into the event you were recording. I would gladly pay for the app to get rid of the ads and the glitch of spontaneously shutting itself down. That being said, it’s totally an app that I would recommend. 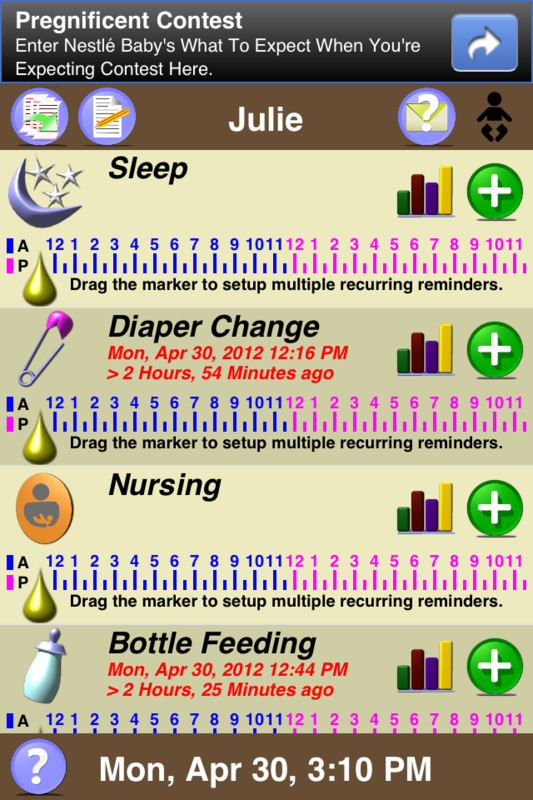 It helps me in my endeavor to be an organized mom… or at least, one who knows when her baby was fed and changed last. Disclaimer: this is a completely unsolicited product review, so that means that there’s zero doubt that all opinions are 100% my own and no one is paying me for it.